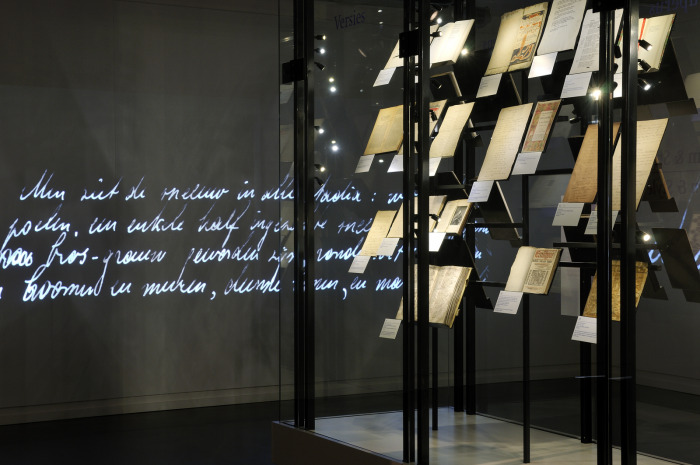 More than 100 BrightSign-powered interactive video screens have been installed as part of major refurbishment at the Netherlands Literary and Documentation Museum in The Hague. Bringing to life the stories of Dutch and Flemish authors and poets in the Pantheon gallery, an audio-visual wall of fame features 100 literary figures from 1000 years of history. Further BrightSign units drive DLP projectors and kiosk-style installations. Design/Integration Companies: Visual Hardware Services BV, interior architects and designers Opera Amsterdam, audio visual production, MuseumStudio, Amsterdam. Project: Continuous video/soundscape spans 100 interactive LCD displays in the Writer’s Pantheon; 8 fully-featured HD1010 players are used for large video projected displays; 7 specially designed booths allow visitors to watch related movies and plays; listen to famous poems or prose readings. Simple implementation of interactivity using BrightAuthor’s simple-to-write play lists that easily assign playback of media to buttons and other general-purpose devices. Implementation of interactivity using simple-to-write play lists that easily assign playback of media to buttons and other general-purpose devices.